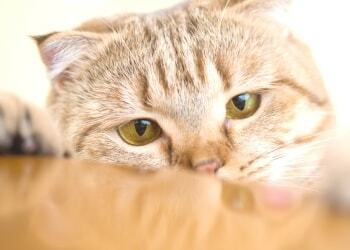 4 Quick Tips for Keeping Your Cat Safe! The holidays are here! Every year it seems like they arrive before know it, but holidays aren’t just for humans. Many cats get excited about them too! Especially with all the wonderful aromas of roast turkey, baked ham, and other goodies. So inevitably, the question of whether sharing holiday foods with cats is safe, is bound to come up. Keep cats healthy and safe this holiday season when sharing treats with them. In case your favorite feline does manage to get into trouble this holiday season, cat insurance can help pay for costly veterinarian bills. Cats will naturally want something special to eat, and many cat owners love to treat their cats to some of the same holiday specialties they indulge in. Of course, you don’t want to give your cat food that might be bad for their health. So here are four guidelines to follow in order to safely share seasonal goodies with your cat. As a general rule of thumb, what’s healthy for you is more likely to be healthy for your cat too. Avoid fat and stay away from candy. Cats have fewer sweet receptors on their tongues, so most of them don’t have a “sweet tooth” like dogs or people. Although we may like to gorge on KitKat bars and other candy on Halloween, they won’t look too tempting to most felines. Still, it’s important to know that chocolate, grapes and raisins can cause trouble for cats. Lean, cooked meats or fish are probably one of the safest treats for your cat. Cats are obligate carnivores, so their systems are designed for digesting high protein, low carbohydrate meals. Feed small amounts and avoid breaded items, fried foods or heavily-seasoned meats and fish. Place the tidbits directly into your cat’s bowl to discourage begging at the table. Small amounts of vegetables or fruits are also usually fine. Typically, veggies aren’t a huge attraction to cats, but I’ve had a number of clients over the years tell me how much their cats enjoy occasional watermelon, corn on the cob or other oddities. Place leftovers out of reach or in the refrigerator where cats can’t get them, and be careful of where you keep the garbage. Cats can raid garbage cans just as well as any dog, and they can chew through the plastic bags too! Poultry bones stolen from the garbage can splinter and cause blockages or perforations in the cat’s intestinal tract. Strings from the turkey are often coated with fats and meat juices, and can be very tempting to cats. Swallowing these strings can cause serious illness or even death without proper and immediate veterinary care. If you plan to treat your cats over the holidays, subtract about 10% of their regular diet to avoid feeding too many calories. Overfeeding can easily contribute to your cat becoming overweight. For a special treat for your cat, here’s a recipe I found online. It’s fun and easy to make it perfect for any holiday, simply by using seasonal cookie cutters. Preheat oven to 300 degrees. Combine water, cheese, margarine and oil. Add flour and form dough. Roll to ¼ inch thick and cut with small holiday cookie cutters. Bake on an ungreased cookie sheet for 20-25 minutes or until golden brown. For a quick list of 9 Holiday Food Hazards for Pets, click here. By Dr. Jane Matheys, a veterinarian and writer for Pets Best. Since 2005, Pets Best has been offering cat health insurance plans. Learn more at petsbest.com.